The FREQUENCY function is one of the statistical functions. It is used to сalculate how often values occur within the selected range of cells and display the first value of the returned vertical array of numbers. 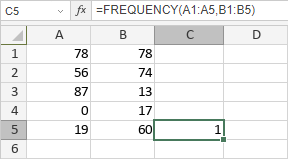 bins-array is the selected range of cells containing intervals into which you want to group the values in data-array.